The SMWS bottles Glen Grant whiskies under distillery label 9. The Rothes distillery was founded in 1840 by John and James Grant. The four wash stills and four spirit stills produce over six million litres of spirit on an annual basis. Glen Grant is now owned by the Italian Gruppo Campari. The most common (and widely available) whiskies are The Major's Reserve named after James Grant junior, son of the founder, and the 10yo. The name provokes far less emotion than "Laphroaig" for instance but Glen Grant is one of the top 5 best-selling Scotch single malts worldwide. Colour: Light yellow in colour. Almost straw like. This was probably a fino or manzanilla sherry cask. Thick yet fast legs on the glass after swirling. Nose: On the nose, this Glen Grant offered me lemon and ginger tea and fireworks. The smell of firing a cap gun (remember those from your youth?). Citrus and spring flowers. A botanical garden and potting soil. Dark cacao with fino sherry and salt. Green jalapeño peppers and pear wine. Taste: The palate is dominated by hot pepper, fresh citrus, thyme and honey with some fruit pastilles. Perfectly drinkable at 55% ABV. You don't need to add any water. Just enjoy the ride on the battleship! Finish: A refreshing finish stuffed with green herbs and honey tea. The nose of this 25-year-old Glen Grant was very promising and impressive. I honestly enjoyed nosing this whisky more than tasting it. Though I could blame that on the size of my sample. 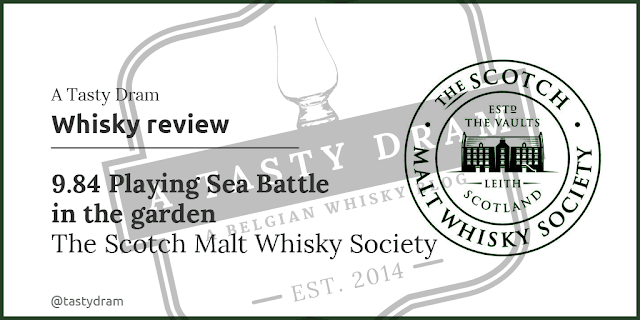 "Playing Sea Battle in the Garden" costed £98.00 at smws.co.uk. The Dutch branch sold it a few months ago at the (reduced) price of €120.60.